Jerome Wetzel is the Chief Television Critic for Seat42F and a regular contributing reviewer on Blogcritics. He also appears on The Good, The Bad, and the Geeky podcast and Let's Talk TV With Barbara Barnett. Article first published as TV Review: THE LOOMING TOWER on Seat42F. Hulu’s latest miniseries is THE LOOMING TOWER. Based on the non-fiction book of the same name by Lawrence Wright, the ten episodes cover the lead up to the 9/11 terrorist attacks. Beginning in 1998, with some flashes to hearings well after the fact, we see both the FBI and CIA bungle up their own investigations while refusing to work together, telling the vital story of how Osama bin Laden may have been prevented from killing thousands, but wasn’t. It’s pretty good drama. At the center of THE LOOMING TOWER is John O’Neill (Jeff Daniels, The Newsroom). He’s head of the FBI New York branch, and he has personal issues with just about everyone in his life. His subordinates seem to mostly respect him, but his bosses don’t, nor do the CIA officers he comes in contact with. Thankfully for O’Neill, Richard Clarke (Michael Stuhlbarg, Fargo) listens to him, but Clarke can only do so much. If O’Neill’s professional flaws aren’t enough for you, he has multiple girlfriends and a wife in various locales, so he’s a deeply flawed character. Contrast that with Ali Soufan (Tahar Rahim, A Prophet), a more traditional hero. Ali may have joined the FBI on a dare, but he is totally committed to working under O’Neill and trusts the boss’ judgment. He doesn’t hesitate to drop personal matters at a moment’s notice when called upon to do his duty, and is only too eager to put himself into dangerous situations if he thinks he can do some good. O’Neill tempers Ali by looking at the bigger picture, but that’s about the only place where O’Neill is better. Other than those two, most of the other characters are much smaller. 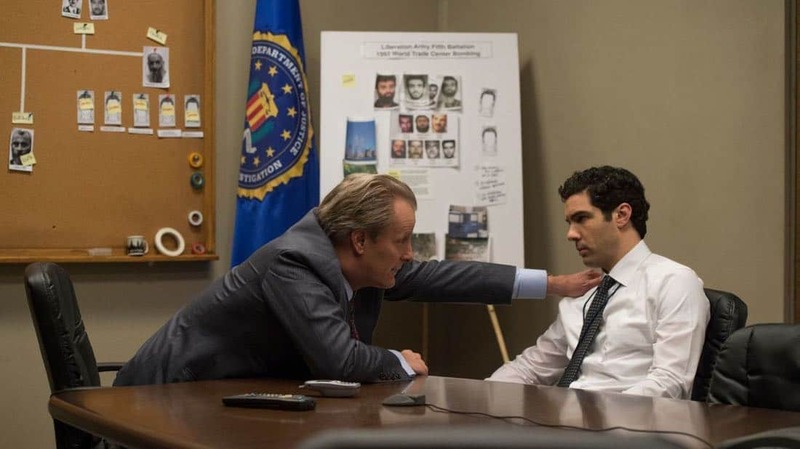 From CIA antagonist Martin Schmidt (Peter Sarsgaard, The Killing), to Schmidt’s loyal underling, Diane Priest (Wrenn Schmidt, Outcast), to teacher Heather (Ella Rae Peck, Gossip Girl), to many others, THE LOOMING TOWER is stuffed full of players, each with their own story and agenda, most of them minor to the main plot. This makes sense for a dramatization of this nature, which surely has a lot of moving parts. And with ten episodes, the miniseries doesn’t need to stay too focused. Still, much of their scenes seem like fluff, rather than driving the story forward, even if the supporting characters are fully formed. An exception to that is Robert Chesney (Bill Camp, The Night Of). Although his role as a member of O’Neill’s team is not a huge one, he has some very compelling scenes in the first couple of hours that really make him an interesting character. THE LOOMING TOWER has the weight of an HBO-level miniseries, and is a strong contender come awards season. It has great performances and the heft of being mostly real. The production value and directions are of good quality, and its narrative is smart and cohesive. Where it wavers for me a bit is the pacing. It feels like it’s balancing too much, and is weighed down by it. When certain characters are on screen, it flies beautifully. When they’re gone, or when we’re venturing into O’Neill’s romantic territory, it falters. I enjoyed the first two hours I watched and will likely watch more, but I can’t help but feel that a leaner series would have worked better. The time frame covered could have been extended if they still wanted to make the same number of episodes. One thing I thought was pretty cool was that the World Trade Center towers are not glimpsed for quite awhile at the beginning. And the only shot of them in the first two installments is in the background, not a focus of anything happening. They loom over everything, but aren’t part of the story. Not yet, anyway. Hulu has released three episodes of THE LOOMING TOWER, with more coming weekly. If I could do anything I wanted to, I'd split my time between writing exciting novels and developing television programs, and reading great books and watching wonderful television shows. I Make Very Little Writing These Reviews! If You Like Them, Please Donate Any Amount!